Is Being a Thought Leader Still a Thing? In part one of our recent conversation with Dan Kuschell, the angel investor and “business growth specialist” talks about his childhood ambitions of playing professional baseball, how an adolescent interest in neuroscience led him to a career in marketing, and why a brush with death made him a better leader, father, and overall relationship maker. In the process, we explore whether the concept of “thought leadership” still holds true in our oversaturated era. The three questions that can change your life. Deciding who you want to be a hero to. Unusual ways to turn childhood dreams into a gratifying living. 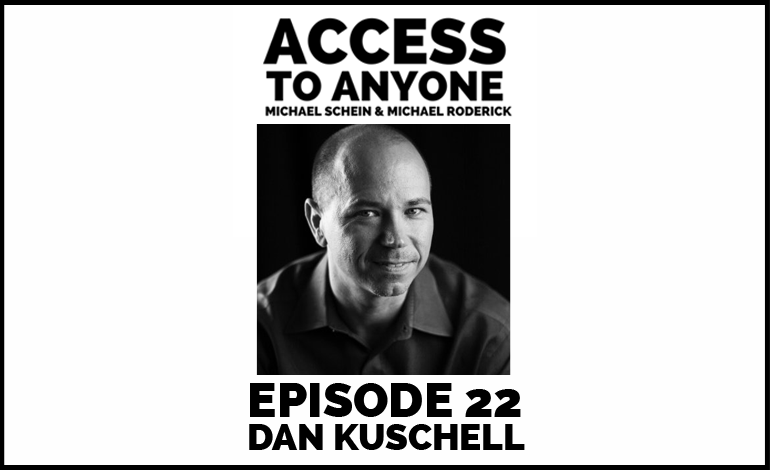 Dan Kuschell works on the leadership team with Joe Polish and Genius Network and is an expert at helping companies scale and grow 2x, 5x, even 10x or more. He’s the founder of Growth to Freedom™, ProsperityBasedLiving.com, creator of Millonaire’s Mindset®, and the bestselling author of Bootstrap Business as well as A Champion in the Making: Awaken the Champion Within Your life, Business, and Relationships. Dan started the first of 11 companies back in 1992 and has been on NBC, ESPN, Spike TV, Wall Street Journal online, Entrepreneur, numerous radio and TV programs, and can show you how to have greater impact, contribution, and significance.